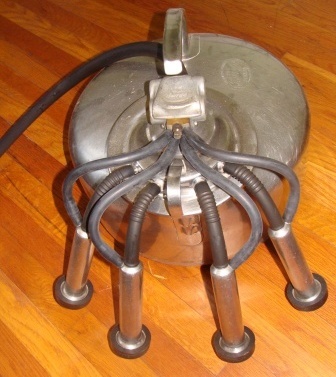 Surge belly milkers have been used for many decades. (Click here for a 6 minute video done by someone else describing the parts of the machine). A Surge milks the cow out better than any other machine. 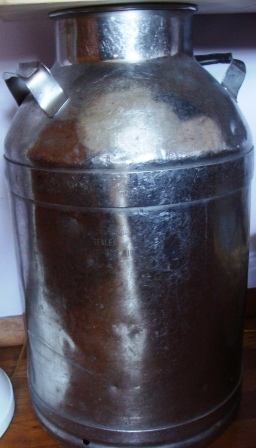 Stainless Steel Can – Has a handle which can be put on a Surcingle (strap around cow’s back) AND needs to have a lip on the rim where the lid slides onto the bucket. 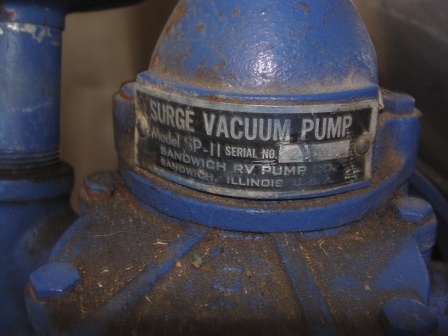 Lid – The top of the lid has a small rubber ring (on some styles) and a check valve (that has a rubber cap, this is on all styles of Surge) that go on before the pulsator is put in place. Pulsator – Has a lid, usually attached by a hinge. Don’t be worried if yours looks different – Surge “styles” changed a lot over the years! Pulsator speed can be adjusted with the needle (shown taken out of the pulsator. It goes into the hole between the four air ports on front of the pulsator.) 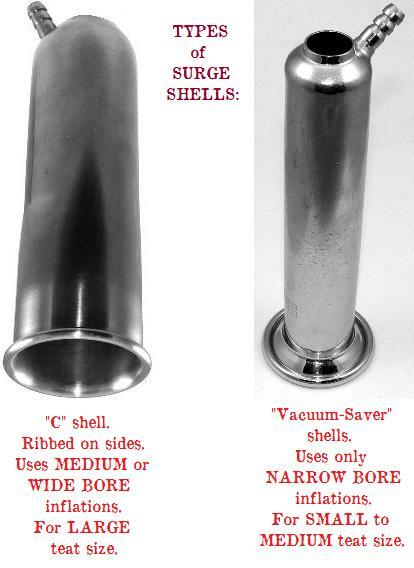 You adjust by tightening or loosening the screw needle. Pulsator speed should be relaxing, not hyper. About as fast as saying one-one-thousand for a full pulsation (swish, swish). Imagine milking by hand, that goes fairly slowly. You need enough pulsation to get the cow milked out, but hyper speeds will just damage the teat ends and cause extra unnecessary stress to the teat. CLICK HERE to view a short video on how fast a pulsator should pulse. And remember: only oil your pulsator infrequently, maybe once a month depending on how many cows you have. (We milk on average two cows most of the year and we oil the pulsator maybe once every other month.) ONE drop of oil per leather (on the top of the pulsator, see in the picture the two round holes? Don’t oil those, but if put your finger on the hole and slide the metal from one side to the other, you’ll see little open notches on each end. One drop per notch.) Too much oil will gum up your machine and it won’t work! 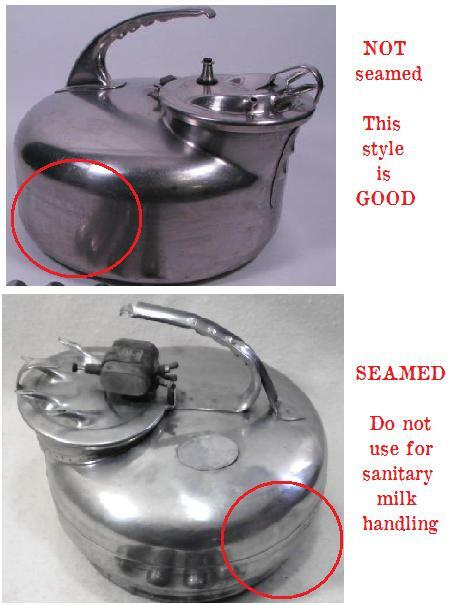 Too little oil and the leathers will not expand enough to create suction and pulsation will stop. The shells are the stainless steel containers that surround each inflation and act as the wall. The inflations are put through the shells and pulled snug until the ridge comes out the bottom of the shell. The inflations attach to the lid and can be removed for cleaning. TIP: Leave the inflation hose 1/4 inch from the bucket when installing new inflations. When you need to take them off, grab the base of the inflation where it attaches to the lid of the machine and push inward toward the lid. 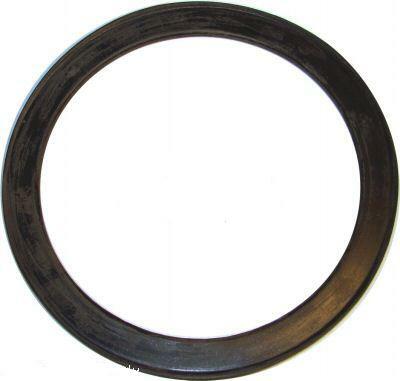 This helps break the seal that the rubber tends to form. Then pull up and the inflation should pop right off. Air hoses: – The large black air hose on the back of the bucket is the supply of air coming from the pump. Measure your vacuum air supply port (large one on rear of pulsator) and vacuum pump intake port for the accurate diameter hose to buy. Comes in black or white from dairy supply stores. 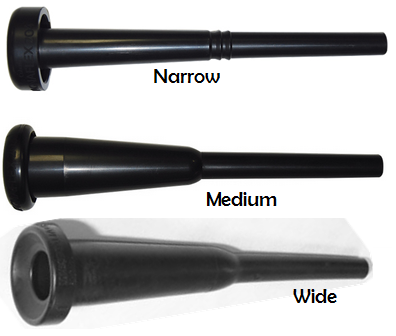 The four smooth tubes on front are also air hoses, each one dedicated to one inflation/shell set. One end hooks onto the pulsator, the other end hooks on to the corresponding small port on the shell. These tubes supply air to each inflation and cause the squeezing action that mimics nursing/hand milking. The handle hooks onto the surcingle (the leather strap with a metal bar). Adjust to fit your cow, but the strap should be forward from the hip bones toward the middle of the back and the bar should be as low as possible without pulling on the udder too much. In addition to using glass jars for storing you milk, you might be able to find, new or used, milk buckets. ONLY use stainless steel buckets or food-grade plastic buckets. Anything rusty should never be used for food grade products! The benefit of milk buckets is that you can place your strainer right on top. The bucket on the right is a BUHL, about 3-4 gallons, and has a spout on the bottom with a plug. This bucket works great if I want to let it set a few days refrigerated and then unplug the bottom, letting the skim milk drain into another bucket until cream starts to show. Plug back up and you have your cream for butter or cream cheese! This is called a “gravity method” of skimming cream. 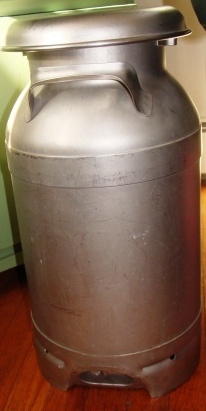 The one on the right holds about 10 gallons and is more useful if you have a walk-in refrigerator. Good luck carrying it! Surprised to know about the new facts! 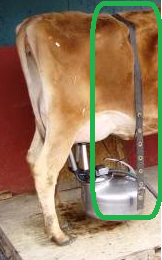 QUALITY speaks a lot in this blog, describing the parts and the milking machine, position to use the machine. Great tip !! I will be getting some goats and sheep to start a meat and dairy farm in Nigeria. I will be milking Nigerian West African Dwarf goats and a few Boar goats as well as Yankasa sheep which has the highest milk solids and butterfat of any Nigerian sheep. I really want a milking machine but I can’t justify the expense. I am thinking of building one with a pulsator but all I could see while searching for guidelines are vacuum milkers which are painful in my opinion. Would it be possible to send me a DIY guide on how to build a milker with a pulsator? I can get the milk supply parts on eBay with the pulsator but I don’t know if I will be able to connect it to a big mason jar or a milk bucket/pail customised to fit. I also don’t know if a narrow inflation will work in a medium syringe(just thinking) or even a breast pump seeing as how it does the same thing with a milker. :-D. Please let me know your thoughts on this. Thank you. Hi. I have a few goats and sheep coming in and though I still have to wait awhile to milk the,, I just can’t justify the expense of a milking machine. I have been reading up on a DIY milking machine but I am interested in adding a pulsator to my machine. I poor at mechanics but all the builds I have seen are just for vacuum and that will hurt the animal.. Do you know of a link to how to build from scratch and also attaching a pulsator to the set up? I will be milking Nigerian West African Dwarf goats(I live in Lagos Nigeria). I saw some goat supplies online and I will prefer to use that instead of syringe because of the pulsator. Or can I still use a large syringe and fix an inflation inside it or even a breast pump? :-D. I know it sounds a bit silly but I think it is worth considering seeing as the actions of the breast pump and milker are the same. I’ve been told that a breast pump and a milking machine work very differently….I have no experience with a breast pump, so I don’t know for sure. As far as I know, a pulsator requires air (from a vacuum) to function. In the early years of milking machines, some were operated by a stationary bicycle. If you can get a source of air, then you should be able to use a pulsator and retrofit it to your equipment. Ebay is a place you can buy a used pulsator fairly cheaply. Hi there! Was wondering what is a good amount of time on average to leave the machine on a cow? I have quite an old machine, and I leave it on for 2 minutes as I don’t want to hurt the cow… Is that ok time? If the cow has slow milking teats, she may take longer to milk. 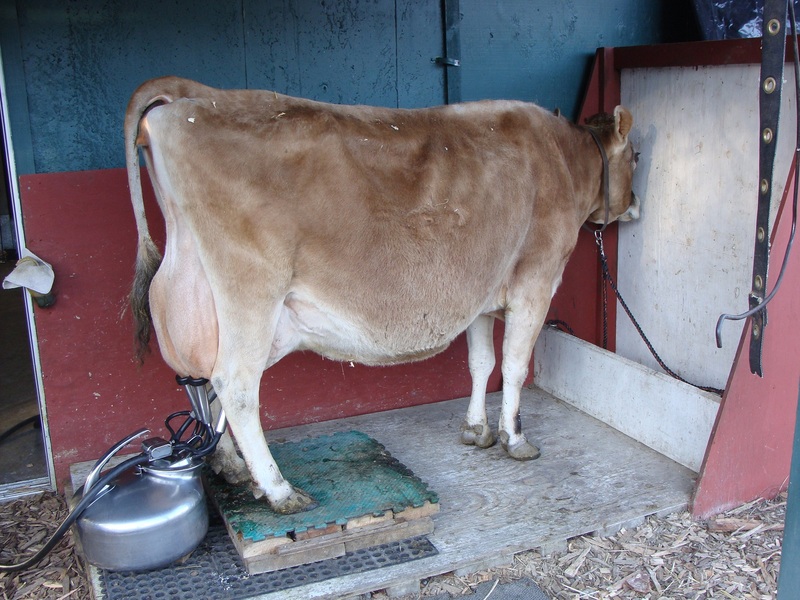 Also, if the cow is milking several gallons in one milking, she will take longer to milk out usually. To know how long to leave your machine on, you can gently massage each quarter and listen to hear if there is still a significant amount of milk coming out. If so, massage a bit and work the milk out until each quarter is fairly empty. You can take off one inflation at a time as that quarter is done, which will help prevent over-milking quarters that get done sooner. 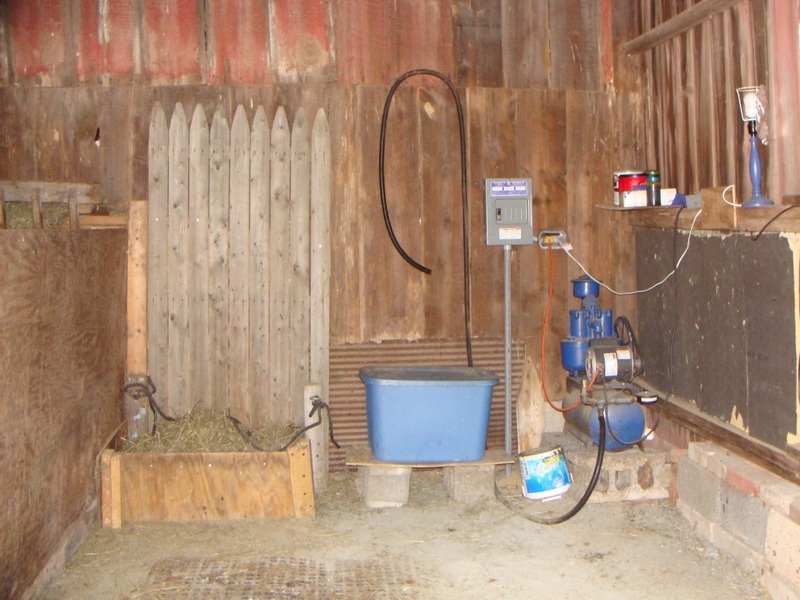 Once you take the machine off, you could test your timing by trying to hand milk each quarter into a bucket. If the cow still has a big stream of milk, you probably took the machine off too soon. If her udder feels empty and only little squirts of milk come out, then you have milked her out far enough. (There will always be a little bit of milk in the udder, as cows continue to produce milk 24/7. Your goal is to get 95% of the milk out so her udder can re-fill with fresh milk.) Once you learn how your cow feels when milked out, you should be able to get into a good routine of knowing how long to keep the machine on. 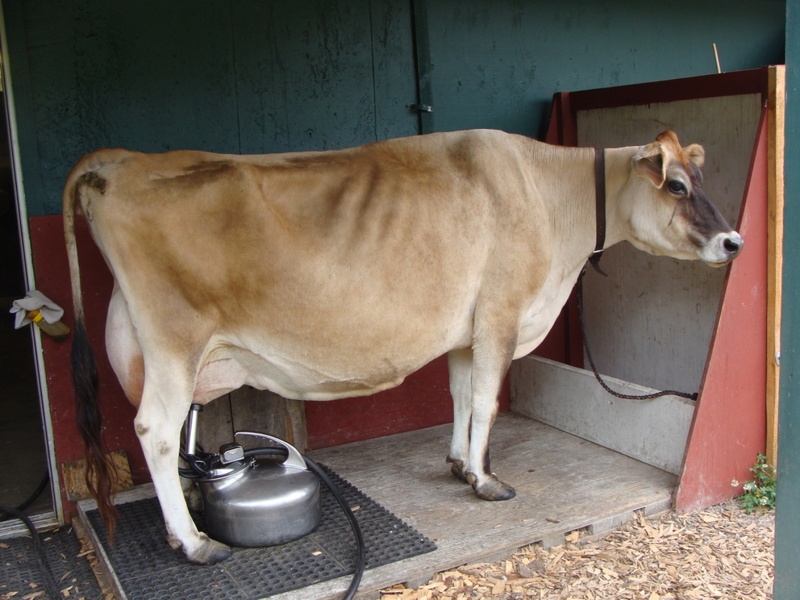 FAQ: When I first start milking my cow, her teats are nice and round and full. After just a few squirts, her teats have gone soft and feel empty. I can still get milk from her but it seems I’m working very hard for every little bit. Is this normal or is it her holding up? Hmm, sounds like she’s NOT letting down for you.For our cows, we go through a “letdown” process, which involves turning on the milk pump, dipping the teats, letting that soak for 30 seconds, wiping the teats, squirting once from each teat, and then we put the machine on. There are lots of variations to that process, that’s just how we do it.And I can definitely feel from when she first comes in (touch her udder then) to when we’re ready to put the machine on (touch the udder again)…She feels like she’s real heavy in the bottom part of her udder, her udder might even go pear shaped because her milk is letting down, literally.On a side note, I was reading in Hoards Dairyman about milk quality and low somatic cell and a bunch of farmers do their dipping and pre-milking in different patterns, so I thought “I’ll pre-milk and THEN dip, like some of them do” so I walked up to my cow and pulled on a teat…nothin! So I just went back to my other routine (mentioned above) and by the time I’ve wiped and massaged, she’s let down her milk, so I pre-milk then, and we’re good enough! FAQ: My cow won’t let down her milk for me, only her calf. If you are wanting to not keep her with the calf, you can (get from your vet and) give her 1/4 cc (.25 in a tiny diabetic needle) of oxytocin in the milk vein OR 2cc (regular needle) IM at milking time. This is the natural hormone that a cow uses to let down her milk. You’re just making the decision for her. It works well for the few milkings you’ll need it until she starts to forget about the calf. If you fight her for long, you may end up seriously affecting her milk production for the year. Also, you can massage the udder, especially high up on the rear udder and all the way down in a soothing motion.